I’ve spent the past several weeks volunteering as a crew member for a local production of “Evita,” as well as attending meetings for a future production. Because one of my meetings was the afternoon before a show, I had decided to go into town early, meander towards my meeting, and then explore a bit of the city before I had to be back at the theatre. It’s amazing how quickly plans can go wonky. Bones dropped me off by a coffee shop and had just pulled away from the curb when the sidewalk apparently twisted away from my foot, causing me to wrench my ankle and fall to the ground. Walking has never been my best trick. I struggled back to a standing position. Tried to walk. Couldn’t. I clung to a wall and tried to figure out what hurt. The ankle absolutely hurt..but honestly? I’ve twisted my right ankle so many times and in so many ways that generally speaking it doesn’t usually phase me for more than a few seconds. The child that lives in my brain couldn’t process what was going on. It felt like I had seriously hurt the muscles in the arch of my foot, making it wicked hard to put weight on my foot. The only time I’d felt pain close to this was when I thought I’d broken my left ankle several years ago. But hey, I didn’t want to vomit, so I knew it wasn’t that bad. So I stood, half leaning on the wall, half trying to figure out how to walk again. An older woman walked past me, stopped, turned, and looked at me. I prepared myself for the obvious question she was about to ask. Ok, so I didn’t expect that question. “I’m sorry, I don’t have any idea,” I panted at her. Disappointed, she walked away. I took a deep breath and tried to put weight on my foot again. This time, I had better success. I texted an update to Bones and limped to the next open door, which happened to be an old school sort of used bookstore. Piles of books and cigar boxes (?) littered the shelves and floor. I looked around, sorta wanting to investigate, sorta afraid I’d knock things over, sorta wondering why there was no one else in the store. An older gentleman holding a laptop was in the doorway behind me. He continued to stand there, looking annoyed. He stepped aside so I could hobble-escape past him. I decided this was quite enough adventure for one day, and so I started to make my way to my meeting, where a friend loaned me an ankle brace that helped me get through the rest of my evening. Of course…of course…my friend Jenny and I had signed up to do a 5K that was scheduled for two days after my latest failure to walk. She suggested we might want to cancel. But, ya know. Stubborn. The first loop wasn’t bad. I had warned Jenny that we would not be breaking any records today (which is a shame because there were so few of us that we maaaaaybe could have actually placed in our age groups had we not been hindered by my gimpiness). Jenny is a great friend and insisted she wasn’t there to be speedy. Which is good, because on the second loop, my ankle gave out on me and I fell pretty much flat on my face for – once again – no damned good reason whatsoever. I was tempted to just…stay there for a while and feel sorry for myself. But. There’s not much that is as motivating to me as looking up and seeing someone on a walkie looking at me worriedly, so with images of ambulances dancing in my head, I struggled to my feet and pretended I was ok.
As it turned out, now I had a gimpy right ankle and a tweaked left knee…and no medal. 😦 Our time was a glorious 1 hour and 9 minutes, which is…ridiculously bad. But! We finished. Because I’m stubborn. ..And this, y’all, is why I’m not an athlete. But! 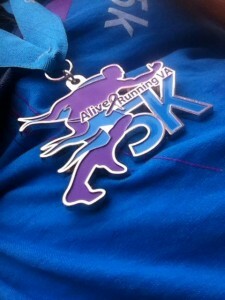 I have one more 5K this year, in a few weeks. I may not make my personal best, but at least I’m sure to do better than I did this weekend. ..Mostly because I got a medal at my first one. ……Which is a whole lot less impressive than it sounds, I assure you. 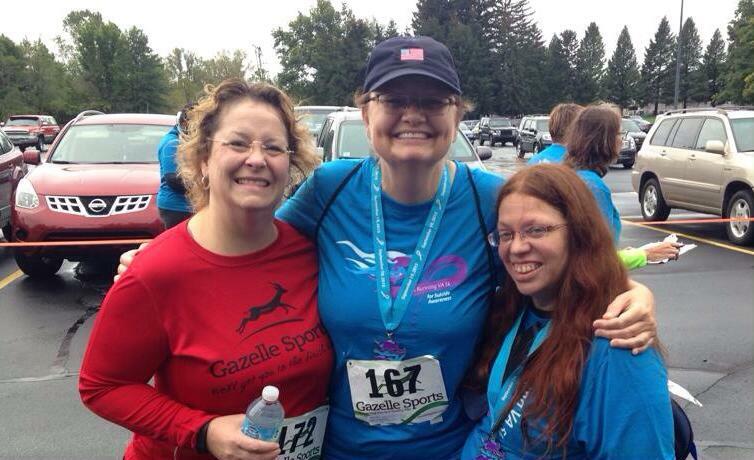 Last spring, my friend Jeanne was talking about participating in a 5K run/walk, Alive and Running. This is an event for suicide awareness, which is near and dear to my heart, and so I tenatively said I’d probably very possibly maybe join her. I changed my mind many times over the next 5 months. I’m not a runner. I don’t actually enjoy walking..I’d rather ride my bike. OTOH, I’m very goal driven, and when I was a kid, I used to do the CROP walk. I can’t remember if I ever raised much money – probably not – and I definitely remember hating the last mile or there of the walk every year. (I remember it being, like, 20 miles, but I suspect it was only 5.) Still, by God, I did it, and so I should be able to walk 5K (3.1mi). Final time was 58:30; I came in 230 out of 262. I’m not sure where that puts me as far as walkers go; there’s obviously room for improvement. Still, I’m not unhappy with my results. And I’m planning to do a few more of these events this year. 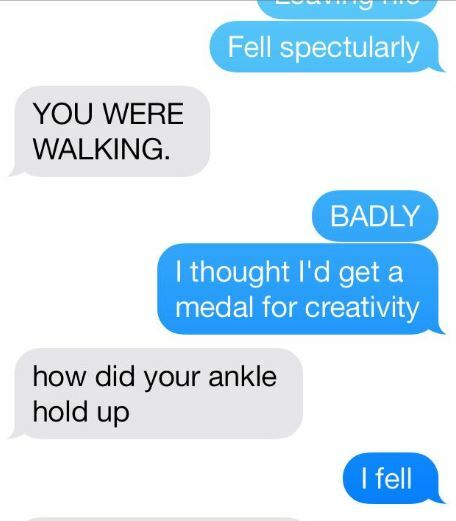 …And I totally wore my medal all day. Which helped me not mind so much that I was icing my feet afterwards because ow. A few weeks ago, I broke my glasses. The fear of broken frames is why I wore metal frames for so many years. I went back to plastic because Bones suggested I’d look good in catseye frames, and he was right. I’ve not been gentle to these things, and I’m frankly surprised they didn’t break sooner…although I’m incredibly grateful it didn’t happen while I was in China last year. Initially we thought we could repair them. This shows you just how long it’s been since I’ve dealt with broken frames. The superglue repair worked for about 1-1/2 days. My getting an eye exam and new glasses isn’t a financial priority – at least, not for me. When you need bifocals, there’s really no such thing as a cheap pair of glasses. I was pretty sure I could make due with contacts, my old glasses, and reading glasses. My last exam, over 2 years ago now, put me at a -6.75 in my right eye and a -5.75 in my left, with a +1.25 bifocal adjustment. If you’re over 40 and you wear bifocals, that all makes sense to you. If you don’t, it’s Greek, so let me explain. This means I’m pretty significantly nearsighted. Even with my glasses, I do not have 20/20 vision and I can’t read street signs and such as well as other people. If I am wearing regular glasses, I can read only if I look under my frames. This is in part why I wear huge bifocals..it forces me to actually use the reading correction. If I am wearing contacts, I can’t read a computer screen, a menu, a book, without reading glasses. This means retraining my brain to NOT use glasses if I’m trying to see beyond the computer screen, which is more frustrating than it sounds. I see halos at night, so I can’t wear contacts at night and drive. Also, there’s a good chance most places will have to order my contacts because my script is *just* at the point of being uncommon enough to not be kept in stock. If I am wearing non-bifocals, I can only read if I (a) look beneath my lenses or (b) put reading glasses on over my glasses. This doesn’t seem to make sense, but it works. Mostly. I mean, it cuts back significantly on what I can see distance-wise. Thanks to computer screen settings, I can enlarge the font to allow me to mostly see without my readers..I think I was up to 170% and it still wasn’t super clear but it was workable. Sadly, it means that if my computer opens a new tab, I’m back to not being able to read the screen. After maybe a week of struggling like this, I ended up ordering some bifocals via Zenni Optical, tweaking my script up to -7/-6/+2. They arrived last night and it is, frankly, almost making me weep to be able to see well again. I just had no idea how bad my vision really is. I feel much more compassion for people that struggle with problems more serious than mine. I’ve spent a lot of time over the past few years wearing my old glasses while I cross stitch because that allows me to watch TV and still be able to see to stitch. My bifocals don’t really allow me to see that much detail. And I’ve been struggling to even browse shelves in bookstores because the focal point is kinda weird. This is *heartbreaking* and it’s not something I’ve admitted to anyone until right now. I’d probably do better with transitional lenses, to be honest, but that raises the price of glasses even more for me. It’s kinda hard to admit to my vision problems. I’m doing so because I’ve never seen anyone else describe what it’s like to need bifocals beyond, “Oh, I put readers on over my glasses to get me through.” This is a part of aging I didn’t anticipate being as difficult as it is. And if I ever leave the country again, I’m absolutely bringing a back-up pair of glasses. Because I can’t imagine dealing with this while away from home.